After an opening cycle of 7 years marked by magnificent albums and memorable concerts, Christian VANDER tired of having the feeling that he was only playing for a elitist clique of insiders, in effect locking him into a sort of musical ghetto. 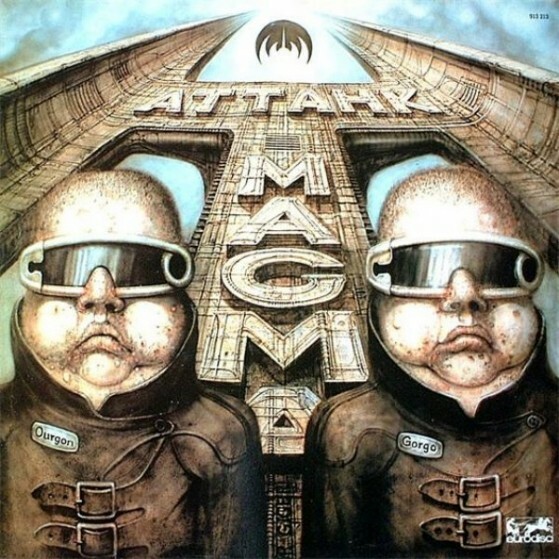 Thus ATTAHK, recorded at the end of 1977, sees the beginning of an attempt to win a wider audience by taking MAGMA in a new direction. Consisting of seven short titles, ATTAHK, by comparison with the earlier discs, offers a simplified music which is much more accessible. This doubting of the form does not however change in any way the basis of VANDER ‘s musical concept, nor does it lose even in the slightest degree its power of fascination. Suited as much to the body as the soul, the music radiates a brutal physical energy comparable to rock, and shocks the listener as greatly as KOBAIA (1970). In ATTAHK, VANDER also reveals for the first time his immense vocal ability and succeeds in the tour de force of making his music more open without betraying the spirit of MAGMA for even a moment.